Update: For the last few months, I’ve been loving and over-using PS Vue’s basic “access plan” which has the benefits of cable without cable. In the months leading up to the election, I found myself watching more and more live TV, mainly election coverage, and DVR’ing the debates and commentary shows. I caught up on every season of TV Land’s “Younger” (highly recommend) and discovered my new favorite network TV show, “This is Us.” However, although I used the Kindle Fire stick on all of my televisions, my main TV, the one in the family room, started to annoy me with its lag-time and audio-sync problems. Amazon suggested that the stick may be incompatible with my Sony Aquos TV so I switched the stick out for the Roku Premiere and voila, problems solved. The Fire Stick continues to work fine on my three other televisions. *A further update: On November 11, 2016, PS Vue dropped all Viacom channels including MTV, Nickelodeon, Comedy Central and TV Land (waaahhh, no more “Younger”). I’ve thought about switching to Sling but I really would miss the ability to DVR shows. To be continued . . . Admittedly, my husband missed live television more than I did. A couple of months ago, I first learned about PS Vue. Playstation had offered a streaming service for years on their game stations but their PS Vue technology only very recently became available on other streaming devices such as the Roku, Android devices including Amazon TV and Kindle Fire sticks, and on Apple TV 4 (unfortunately, not on my old model). FYI, if you want to try out Apple TV and Sling, check out this promotion. Once you’ve gotten yourself either a Roku, Amazon TV, Kindle Fire stick, or Apple TV 4, check out PS Vue’s one-week trial. 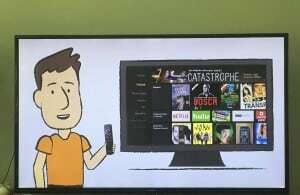 Why the Kindle Fire Stick? Since breaking up with cable, we couldn’t use one of our televisions because I had not purchased a streaming device. After doing some research, I settled on the Kindle Fire stick with voice activation. The voice activation is a nice feature for searching and also uses the Amazon Echo Alexa technology. Alternatively, you can save ten dollars and purchase the less expensive stick; by downloading the free remote control app onto your smartphone, you can utilize the voice activation technology even on the non-voice model. I wasn’t sure how well the Fire stick (as compared to the Fire TV or Roku 3) would work but given its reasonable price, I figured I would give it a shot. Plus, I had read that PS Vue performed better on the Fire stick than the Roku. Completely satisfied, two weeks later, I bought a second stick. Whereas I previously watched Netflix and HBO Now through Apple TV, it now sits unused, gathering dust. PS Vue gives you the ability to “DVR” your favorite shows and keep it for 28 days. For the first time in months, I could watch something later. Although Sling TV seems intent on rectifying this with their beta version, as of now, it doesn’t support streaming on multiple devices. With PS Vue, just like cable TV, my kids can watch their show upstairs while I watch an entirely different show downstairs. The user-friendly Netflix-like display of user profiles allows for each family member to select and organize their favorite shows and record accordingly. I get three times more channels with PS Vue than Sling. Before making any decision, compare the PS Vue channels vs. the Sling TV lineup to determine what fits your own viewing habits. Personally, while I could pay $5 extra a month to add more kid stations to Sling, even their most expensive package lacks some of my son’s favorite channels, Discovery and Discovery Family, that come with PS Vue. Note, A&E is surprisingly missing from PS Vue. More service providers have come on the market in recent years. Check out this comparison chart from CNET based upon your favorite channels. Enough Pros. What are the Cons? From what I’ve read, the speed of your internet can affect your PS Vue experience. Luckily, only twice have I had buffering issues or lips not moving in sync. Furthermore, for some unknown reason, my Sharp TV upstairs recognizes the stick automatically when turned on, yet my TV downstairs, another Sharp, sometimes shows a blank screen. I have to physically remove the stick and plug it in again to fix the problem. It’s annoying but liveable. Upon initial setup, add all user profiles and their favorite shows. These favorites will then appear every time one signs on. Live TV shows you a list of “trending shows” in order of popularity. To use a traditional TV guide feature, click on the “guide” button on the top menu; it’s not very obvious. While PS Vue did add $40 to my monthly expenses, it’s still almost half of what I paid as a cable subscriber (just shy of $200 per month). True, that also included my home phone but I literally never used it. The other great thing about ditching cable is its flexibility: no contracts. Let’s say I go away for three weeks, I can suspend my PS Vue subscription or bring my stick along on vacation. Or, if I want to add Showtime just so I can binge-watch “The Affair,” I can do that. I added Hulu to watch “The Handmaid’s Tale.” Cable-a-la-carte. 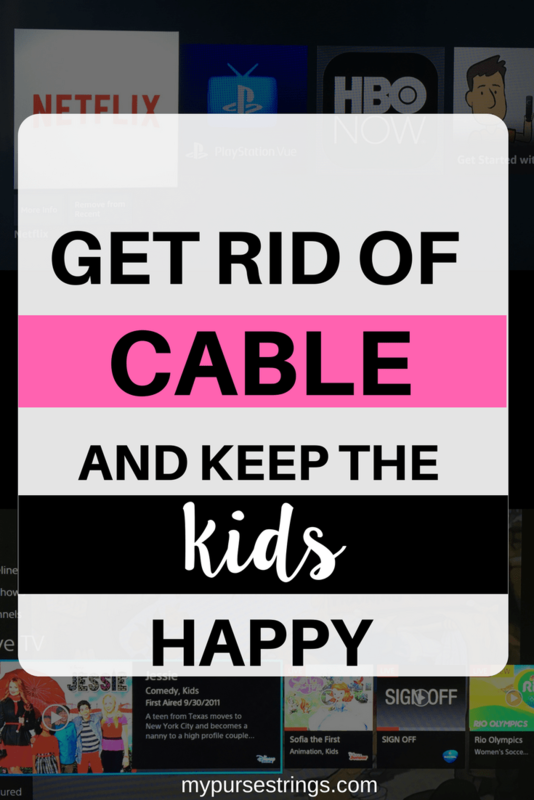 I can’t think of any reason to go back to cable. Click here to get a free 30 day trial of Hulu. *This post first appeared on August 3, 2016. It has been updated to reflect new product information. As God as my witness I will never pay for TV again! Hmmm. I’ve been doing this but my alarm company’s central monitoring to a mobile phone or via radio adds a significant one time and recurring cost. I may rethink using your research. Thanks! I love that u did all of this research I would never have the time to figure it all out!